Showing by example is a fantastic way to learn, particularly with talents like Jolley. In order to appreciate this work, you must first just see some of the extraordinary art that actually becomes easy with the right tutorials. Another of the projects from my book Beyond Digital Photography is this painting of my son. The techniques I developed for this style of digital painting are detailed in chapter five, and are in no way a "beginner's" project. I had been reluctant to include a watercolor emulation limited to Photoshop (instead of also using Painter) until I invented a believable salt effect so characteristic of traditional watercolors. 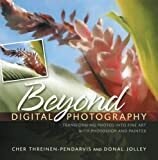 This was created specifically for my book, Beyond Digital Photography, co-written by my good friend and digital art pioneer Cher Threinen-Pendarvis. Step-by-step instruction on how the image was created is included in the chapter on digital collage. It is considered an "advanced level" Photoshop project, though I had to refrain from taking it even further due to page count limitations! That's the kind of dedication Pendarvis and Jolley share all throughout the book. The kind of humanization that makes each project come to life. Digital cameras, advances in color printing, and software tools have changed the landscape of photography forever. At some point, users of digital images will become challenged to go beyond the basic digital photograph and print, and move toward the next level of expression -- true ART. For many, this means pushing the technologies available and combining the artistic tools found in both photography and painting. Geared for intermediate to advanced users, Beyond Digital Photography: Transforming Photos into Fine Art with Photoshop and Painter brings these once separate disciplines together in a beautiful and instructive book that uses time-honored design principles and basic drawing and painting skills, and applies them to digital photographs. The easy-to-follow, step-by-step format allows you to practice a variety of Photoshop and Painter techniques and gives you the confidence to achieve your own expressive goals with great results. See you on a new topic. I am having a hard time choosing the right subject and capture it with magical moments ... but these techniques are wonderful!